McGraw Hill Math: Intended to Confuse Parents and Students? The assignment is about carrying in subtraction. However, the explanation of how carrying works when one cannot borrow from the next column and must “borrow in order to borrow” is a lesson in frustration. 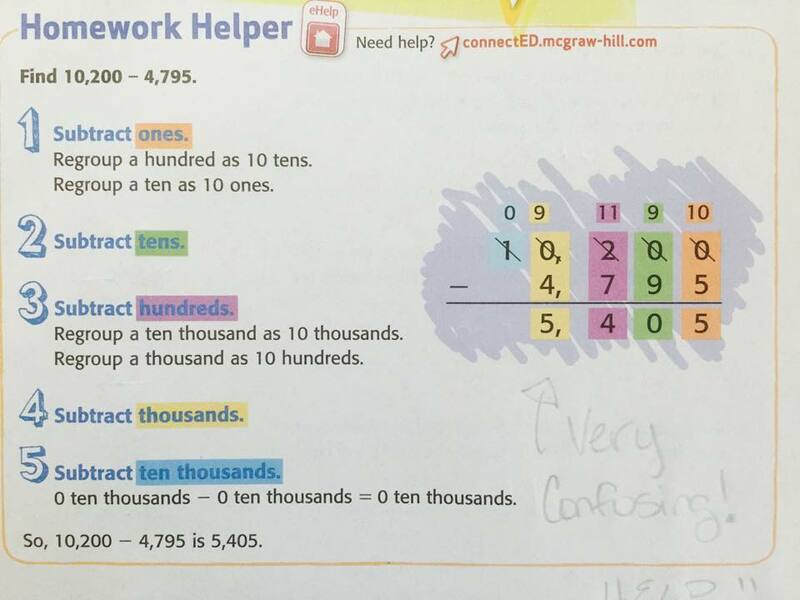 Note that at the top of the worksheet page (posted below), McGraw Hill offers help via ConnectED, a login service offered by by McGraw Hill for its math products. McGraw-Hill officials say leaving the summative and shelf testing markets will allow them to focus on products and services that more directly serve teachers and students in the classroom. David Levin, McGraw-Hill Education’s president and CEO, said in an interview that the company’s major emphasis will be on “instructional materials, and the tools and software to make the most” of resources for students and teachers. If we go back in time, to 2004, McGraw Hill intended to become “the leader in assessment reporting” as it acquired Common Core “architect” David Coleman’s assessment company, Grow Network, and kept Coleman on as CEO until 2007. The best-laid assessment plans. Pity. Let us now turn our attention to an example of the McGraw Hill math product: that fourth-grade worksheet in subtraction by carrying. When borrowing from the next column isn’t an option, you need to borrow from the nearest non-zero column to the left. Because nothing is left in the thousands column, you don’t need to subtract anything else. Therefore, 1,002 – 398 = 604. In the spirit of promoting practical solutions necessary for efficiently navigating life, perhaps Louisiana school districts should ditch the expense of McGraw Hill and its Common Core confusion and invest in straightforward explanations. https://drrichswier.com/wp-content/uploads/MyMath_Logo-e1448674192298.png 392 640 Mercedes Schneider http://drrich.wpengine.com/wp-content/uploads/logo_264x69.png Mercedes Schneider2015-11-27 20:30:162015-11-27 20:30:16McGraw Hill Math: Intended to Confuse Parents and Students?